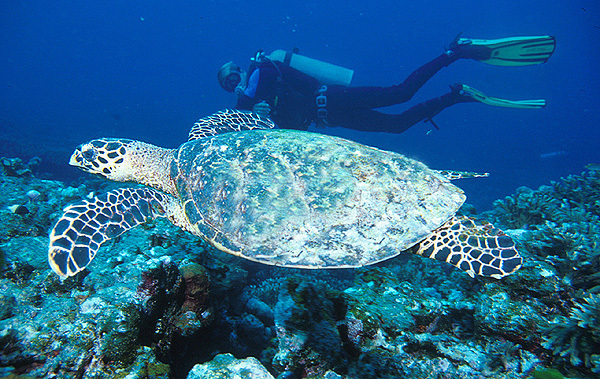 Gulf of Thailand Diving Sites – Brief diving site information’s about the most dived dive sites in the Gulf of Thailand. This dive site is considered to be one of the best dive sites in the Gulf of Thailand, only challenged for the title by Chumphon Pinnacle. Sail Rock a granite pinnacle which breaks the surface coming up from around 40 meters and is approximately half way between Koh Tao and Koh Phangan. As there are no other islands or pinnacles close by Sail Rock is a magnet for shoaling fish as well as a haven for reef fish and critters. As the dive site is exposed there can be strong currents here but the site is big enough to be able to hide from the worst of it. A central feature of this dive is the vertical chimney starting at around 18 meters and opening to the light at about 6 meters below the surface. The chimney is usually full of glass fish and as you exit onto the top of the pinnacle you are presented with a carpet of Anemones and their residents. The rock has many cracks, crevices and holes which are full of life such as White Eye and Yellow margin Moray Eels, Scorpion fish, Boxer Shrimp and Nudibranchs. Sail Rock is one of the main dive sites in Thailand for seeing Whale Sharks and sometimes other big sharks. For the more experienced divers there is a second pinnacle about 50 meters from the main site and this tops out at about 15 meters deep. As this pinnacle is infrequently visited it’s coral are virtually unblemished and it’s critters more inquisitive. Along with Sail Rock this is considered the best diving on the East Coast of Thailand. This pinnacle does not break the surface but starts 12 meters deep going down to about 30 meters and is surrounded by a number of smaller rocks. The base of the pinnacle is coated with anemones and their resident “Nemo’s” (Western Clownfish) and other anemone fish. As you descend you may see some large groupers hiding in cracks and crevices or hanging around the main pinnacle. The Pinnacle is a haven for reef fish and macro life, look out for Moray Eels, File Fish, Masked Porcupine Puffer Fish, Lion Fish, Scorpion Fish and even Stone Fish, also Banded Boxer Shrimp, Crabs and Wart Slugs. Don’t forget to look out into the blue for large Barracuda, Trevallies, Jacks and Mackeral as well as the majestic Whale Shark. In the North Eastern corner of Koh Tao Island you find Hin Wong Bay. This bay offers an ideal location for a relaxing shallow dive and is home for our MV Giamani when located in Koh Tao. With a maximum depth of 18 meters this dive site is a mixture of boulders and hard coral beds alive with multicolored wrasse, Parrot Fish and if you are very lucky you may see the ridiculous camouflage of the Clown Trigger Fish. The perfect place to complete the days diving with a sunset or night dive. Just off the west coast of Koh Tao in about 30 meters of water is the wreck of the HTMS Sattakut which was sunk as an artificial reef in June 2011. Due to weather conditions the sinking didn’t go as planned so in August 2011 a salvage team moved her to her current location. The boat which was built in 1944 as part of the US Pacific Fleet was an Infantry Landing Craft (LCI(M)-739) and saw action in some of the major battles of World War II. In 1947 she was sold to the Royal Thai Navy where she was in service until 2007. She was then cleaned and prepared for the artificial reef project. The Hull of the boat is on the sand at 30 meters with the mast head reaching up to 18 meters below the surface, with her 2 guns still in place this 48 meters long, 7 meters wide vessel makes for a very interesting advanced level dive. In the time since it’s sinking it has attracted many shoaling pelagic fish such as Snappers, Fusiliers, Barracuda and Trevally as well as Large Whiprays and Grey Reef Sharks. Like many wreck is also a home to macro life – flatworms and nudibranchs and little blennies hiding in their holes with just their eyes poking out. A relatively shallow dive site, depth ranging from 5 to 20 meters, White Rock consists of two large boulders surrounded by smaller stones and hard coral beds interspersed with patches of sand where you have a chance to see blue spotted stingrays. Keep your eyes open for Banded Sea Snakes, the resident Hawksbill Turtle and that menace of the reef the Titan Trigger Fish. The Hard Coral beds are vibrant with life such as Angel and Butterfly Fish as well as home to small White Eyed Moray Eels. The picturesque bay made by the three small islands of Koh Nangyuan houses this simple but beautiful dive site. With a maximum depth of 18 meters and an average depth of around 10 meters you can spend a long dive drifting over the densely packed hard corals looking out for the shoals of Banner fish and Jacks as well as the hiding Cat Fish, Box fish and Seal Faced Puffer Fish. Also keep an eye out for the peculiar movements of Juvenile Harlequin Sweetlips. An ideal night dive spot, this giant sheltered shallow bay is lined with large hard coral heads whilst the center of the bay is sand with large patches of Staghorn Coral. Whilst the hard corals attract many reef fish such as Parrot Fish, Butterfly fish and Wrasse the center of the bay can bring some surprises such as Hermit Crabs, Cuttlefish and if you’re very lucky Seahorses. With a maximum depth of 15 meters this makes the perfect wind down dive. Just South East of Koh Tao is the small uninhabited Shark Island. Due to it’s location it is prone to strong currents, though this can make the diving harder it also makes it more rewarding as these currents promote coral growth. On the east of the island are large boulder formations littered with Sea Fans and Whip Corals, on the southern side of the island at about 14 meters is a fabulous soft coral garden. Moray Eels, Puffer Fish and Blue Spot Rays and common sightings here as well as an abundance of Reef Fish. Look out in to the blue and you could be lucky various sharks and other deep water fish are often seen here including the largest fish in the sea – The Whale shark. About 12 km southwest of Koh Tao this exposed dive site consists of one large pinnacle, sitting on the sandy bottom at about 26 meters and rising to about 6 meters below the surface, surrounded by 5 pinnacles rising to around 15 meters which in turn are surrounded by smaller rocks and boulders. The base of the pinnacles are alive with many colorful bush corals which themselves could be sheltering Yellow Box Fish, Scorpion Fish and Blue Spotted Rays. The tops of the pinnacle are blanketed with anemones home to Spine Cheek Anemone Fish. As you descend look for Moray Eels, Pipefish, Porcupine Fish, Banded Boxer Shrimp and Octopus hiding in the rock. Really take your time as this is a great macro site.